One of the most intricately decorated and beautifully furnished castles in Oman, the structure reflects the fact that it is one of the few palaces not constructed in times of war, and was instead made with a focus of the beauty and furnished accordingly. With fine calligraphy etched in to the walls, beautiful artwork decorating the ceilings and decorative arches, windows and balconies, this castle is one of the only castles in Oman still furnished according to the time it was originally constructed in. 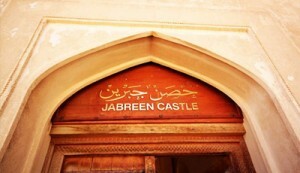 A visit to the Jabreen Castle is a delight for visitors looking to get a feel of ancient times. The mountain range stands at a height of 2000m above sea level with lush greenery and the cool climes that have given it the name ‘the green jewel of the Al Hajjar mountain ranges’. 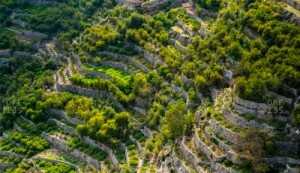 Jebel Al Akhdar is famous for its Fruit Orchards, laid out in a step farming or terrace plantation style along the slopes of mountains. These plantations are watered by the abundant natural springs and Aflaj system consisting of multiple Falaj sets. A large variety of fruit trees can be seen growing here including Peaches, Apricots, Figs, Grapes, Apples, Pears, Plums, Almonds, and Walnuts; The region is particularly renowned for the superb quality of Pomegranate it produces. During the months of March and April the air is heavy with the scent of roses as they bloom across the entire place. During season we can even watch rose water being distilled in the homes of the villagers. The abandoned ruins of the village of Birkat Al Mauz, bear testament to the ravages of time. The village who name can be translated as ‘Banana Pool’ was named after the vast banana plantations that once thrived here. Though its remained abandoned for more than half a century, the village structures of the village are mostly intact and the ruins offer an insight in to the lives of common Omani villagers of the past. Situated at the foothills of Jebel Akhdar (Green Mountains), the village is home to the ancient Aflaj irrigation system which is labelled as UNESCO World heritage. We can enjoy a pleasant walk through the oasis and the date plantations here. 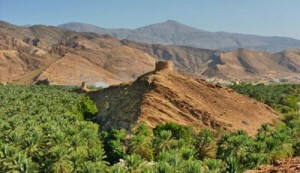 One of the oldest villages in Al Hamra, Misfat al Abriyyin is hidden away on the slope of the mountainside. Set at an altitude of almost thousand meters above sea level, we get an opportunity to admire the panoramic views of the surrounding valleys from the viewing platform, which is a short walk from the village entrance. On reaching the village we can walk around between the crumbling houses set in the mountainside and visit the step plantations cut into the slopes and explore the traditional Falaj irrigation system here. The village is known for the traditional mud houses here made with palm frond roofs, and what is truly unique about them is that these ancient houses were built on solid rock foundations. We can also take a short walk through the date plantations here. Roughly translating to ‘Sun Mountain’ this mountain is thus named as it is the first to experience sunrise every day due to its being the tallest mountain peak of not just the Jebel Akhdar range but the highest mountain peak in Oman. From here we can look down in to Wadi Nakhr to fully admire it depth and mammoth proportions.